OverviewPikmin 2 continues the adventures of Captain Olimar as he returns to the planet he spent so long trying to escape. His mission: collect treasures to prevent his company from going bankrupt. 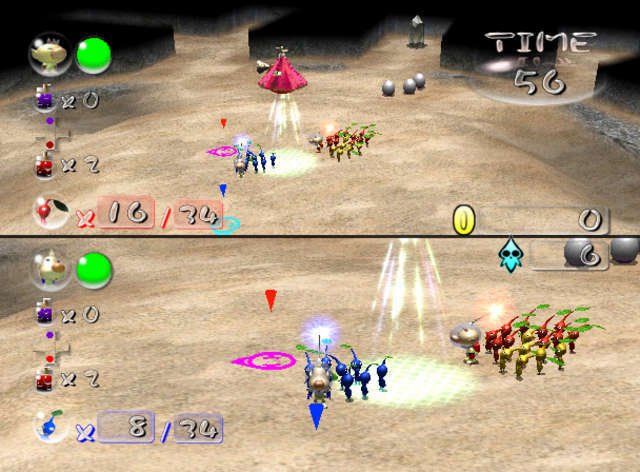 Pikmin 2 is a unique cross between Real Time Strategy and the action adventure genre. Developed by Nintendo EAD. Pikmin 2 stars a tiny middle aged alien named Captain Olimar who works for the Hoctate Freight company on planet Hoctate. After the events of the original Pikmin, Olimar returns with a bottle cap souvenir for his kids to planet Hoctate only to find his employer - the Hoctate Freight company - swiming in debt and on the verge of bankruptcy. 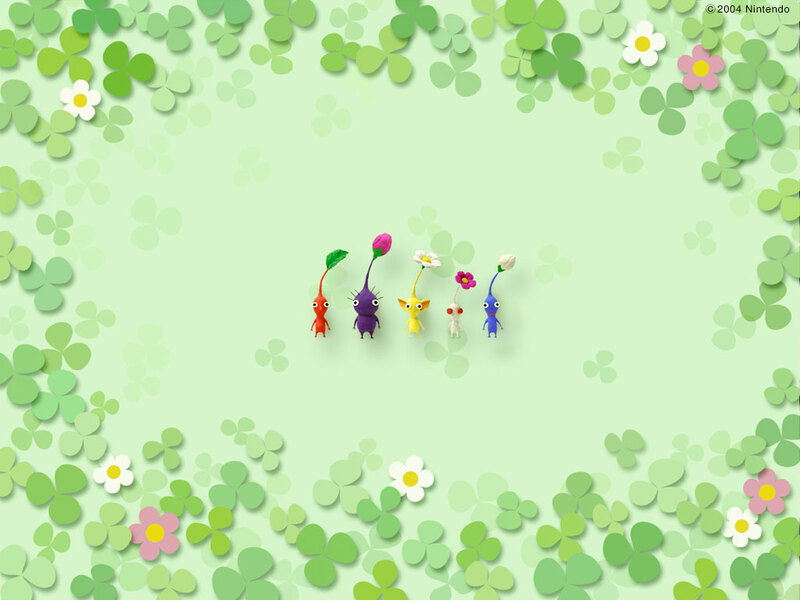 Shocked upon hearing the news, Olimar drops the bottle cap from the Pikmin planet. The cap was then scanned by the company's last remaining space ship and was deemed it as valuable treasure. 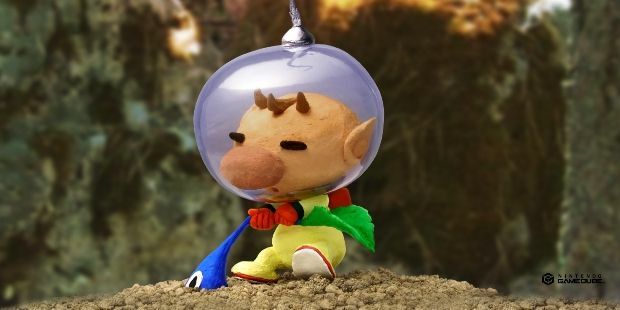 Hoctate Freight President sends Olimar back to the Pikmin planet along with company employee Louie to look for more treasure from planet Pikmin to pay the company's debt. Pikmin 2 is a higher quality production than the original. The game fixes nearly all of the original slight annoyances while adding new ideas and modes. 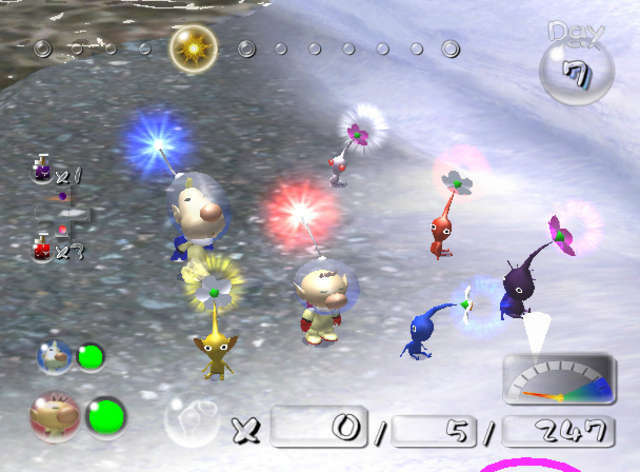 2 types of Pikmin were added: Purple Pikmin (burly, slow and with the strangth of 10 Pikmin each) and White Pikmin (poisenous when eaten by enemies and with the ability to find buried treasure). There is no limit to how many days can be spent looking for treasure. 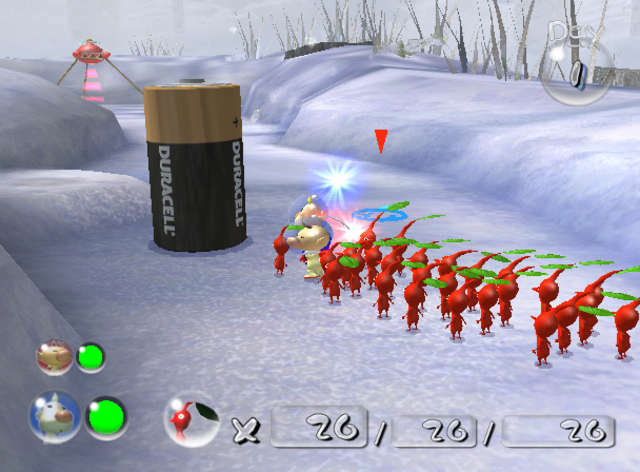 The players can take their time and explore the Pikmin planet's lovely areas. Dungeons were also added for the players to explore, with each floor randomly altered. Also an encyclopedia was added which is filled with funny bios of every creature that you meet, and every treasure that you find, giving the game a bit of a nature show feel. And with over 200 unique pieces of treasure and multiplayer and mission modes, the game is packed to the brim. 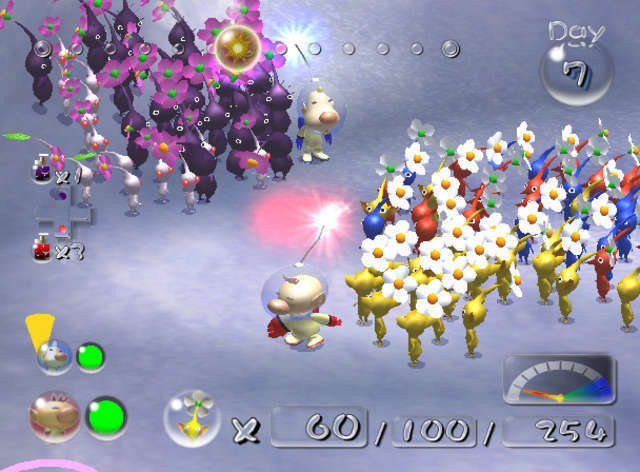 --- Pikmin 2 might have one of the most selfish video game premises in history. 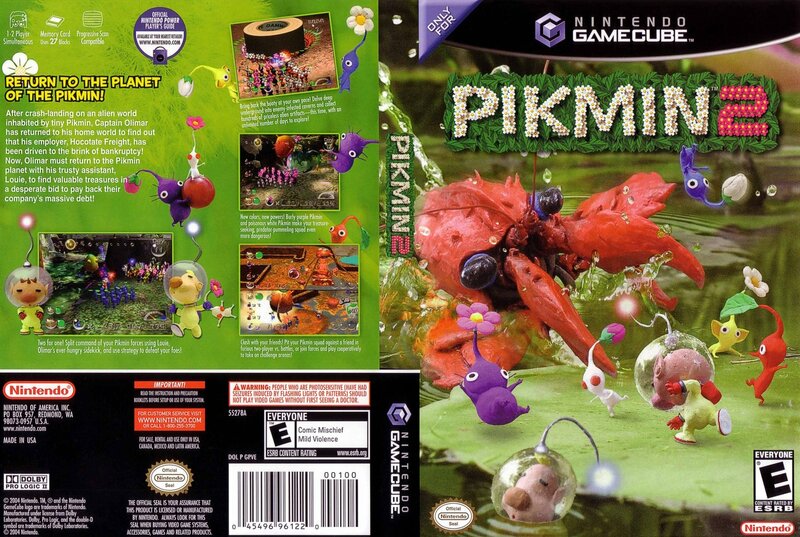 Olimar and Louie send the Pikmin (cute innocent wonderful creatures) to dangerous areas and certain death situations to find treasure and to pay their company's debt. The amazing thing is that the game is adorable and just wonderful from start to finish. I loved every second. Captain Omar is travelling in outer space when suddenly a meteroid hits his ship! He manages to manuever to the closest planet, but his rocket falls apart on the way down. He awakens to find a strange race that he names Pikmin, and enlists their help to put his ship back together before his life support runs out. This game is amazing, and much better than the previous game. There is nothing I would change in this game, It's just that perfect. This game has amazing replay value too. I also totally like the new idea of the two player game such as battle mode and challenge mode. They are loads of fun. Now you can add videos, screenshots, or other images (cover scans, disc scans, etc.) for Pikmin 2 to Emuparadise. Do it now!